While providing LinkedIn workshops recently, several questions have come up again and again regarding endorsements and recommendations on LinkedIn. While many of the workshop attendees appreciate being endorsed for certain skills, some are confused by the process. In fact, they are either being endorsed for things they may not even do, or they are confused as to why so many people are now endorsing them. First, in my opinion, LinkedIn has added the endorsements option to make it easier for others to quickly say, “Yes, I think that you are pretty good at XYZ skill.” Endorsements are a quick way to add credibility to your skills, without asking too much from your connections. LinkedIn even provides them with suggestions for endorsement items. This will appear at the top of the screen each time someone logs into LinkedIn. After you receive endorsements, they appear at the bottom of your profile as a list of specified skills, along with the associate profile photographs of those that endorse you for the particular item. This is a great visual for those that may be reviewing your profile. Someone may be able to quickly deduce that one of your top skills is “Public Speaking” simply be glancing through your endorsements at the bottom of the profile. Now, even though endorsements are a way to leverage your expertise, LinkedIn provides an even better way to recognize your skills. Recommendations are written excerpts by connections that have worked with you in the past. In my opinion, recommendations are more meaningful than endorsements because they have been crafted by someone that has taken the time to create something unique for you. Rather than just a click of the mouse for an endorsement, a recommendation is something that is written exclusively to discuss your skills and accomplishments. So, when given the option, a recommendation always means more than an endorsement. Although it may be more difficult to gather recommendations, they are worth far more than someone just clicking a mouse saying you are good at a particular skill. Don’t be afraid to ask for recommendations. Think of it as asking someone to be a reference when you are job searching. And, be sure to ask someone that truly knows your skills and abilities. In the long run, these recommendations will lead to success on both your LinkedIn profile and in your professional life. If you are a sole proprietor or own a small business, you may have already discovered something: there is not enough time in the day to accomplish all necessary tasks. There is too much to do and not enough time to do it. And, to make it even more complicated, everyone is joining various social networks and encouraging you to do the same. How will you find that for that? First, you need to find the time to implement some type of social media into your business. And, keep in mind that what works for one business may not work for your business. This means you have to investigate others in your industry, discover what they are doing, and modify that to make it work for you. After you have made some decisions regarding how you hope to use social media, you should start slowly. I recommend this because entering the world of LinkedIn, Facebook, Twitter, and other social media tools can be overwhelming. If you are not familiar with social media or have little experience in this area, then just choose one. Decide which social media tool will provide you with the “biggest bang for your buck” and focus on that one. Then, put a plan in motion to slowly utilize other social media sites in the future. Based on my own experiences, I would recommend starting with one, using it for three months, and then introduce the next social media tool. Next, make a plan and stick to it. If you just open your social media account and don’t use it, it won’t do your business any good. So, if Tuesday mornings and Thursday afternoons are slow at your business, then use those time blocks to work on your social media updates, statuses, and offers. By keeping a schedule, you are more likely to be consistent and focused. Finally, if you need assistance with social media, then be sure to ask for help. In fact, there are people that help other businesses get started with social media and can even maintain your accounts. Contact Feather Communications if you are interested in finding out more about this option. Best of luck as you start your social media journey! Recently, I saw the following question on LinkedIn: “Do I always need to send a cover letter when I apply for a job?” Because I was specifically searching in the Answers area on LinkedIn, I felt the need to introduce my viewpoint. YES! YES! YES! In my opinion, job applicants should always send a cover letter to the potential employer. First, most employers require cover letters when applying for a position. If the advertisement asks for a cover letter, then send one. Many job applicants ignore some or all instructions in an advertisement; this is the first test of a potential employee. Next, the cover letter provides a way for the hiring manager to learn more about the applicant – beyond the initial ‘form’ format of a resume. While the resume may offer your past job titles, duties, and dates of employment, the cover letter allows you to go beyond the basic information. In the cover letter, you are able to discuss your accomplishments, additional training, and experiences. Finally, the cover letter IS your first impression. 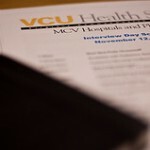 Many employers read the cover letter prior to reading the resume. Your cover letter will be reviewed before you call the company or before you walk through the door. If your cover letter is dull or contains grammatical errors, the potential job opportunity may be lost. Use your first impression and make it count. So, you have a LinkedIn profile and it’s ‘out there’ for everyone to see. How can you make your LinkedIn profile more engaging and dynamic? Is there a way to add some sense of ‘importance’ or ‘relevance’ to your skills? If you are interested in making your LinkedIn profile stand out from the rest, I highly suggest asking for recommendations. Before you ask for recommendations on LinkedIn, think about whom you want to ask. Do you want to ask everyone you know or have ever worked with for an endorsement? Probably not. I recommend making a list of current and former co-workers, supervisors, and customers that can attest to your work ethic, dependability, and work performance. Do not ask all co-workers, all friends, or all suppliers for positive feedback. Be sure to have a variety of endorsements from various viewpoints; this will show potential contacts and employers that you have an ability to work well with a diverse group of people. And, consider the writing skills of the people you are asking for endorsements. Although you can review the recommendation before it goes public, consider how awkward it may be to have to re-write an endorsement given to you. Also, please realize that some people will want a recommendation in return for the one they give to you. Finally, be specific about your recommendation requests. Instead of saying that you would like a general recommendation of your work, be precise about your needs. For example, for my business, Feather Communications, I may write something similar to the following: “Could you recommend me based upon my communication and presentation abilities?” This will give the person a starting point for providing the recommendation. Don’t be afraid to ask for recommendations on your LinkedIn profile. However, be careful and deliberate when selecting recommendation providers. Recommendations add relevance and build your reputation on your LinkedIn profile. If you created a LinkedIn profile six months ago or a year ago and never use it, you are not alone. Or, you may only have ten connections and haven’t used LinkedIn for quite some time. If you are someone that has a stagnant LinkedIn profile, it is time to broaden your horizons and utilize this wonderful social media tool. The first step in utilizing LinkedIn is to ensure that you are connected with people and potential business contacts. 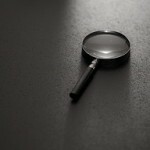 There are several methods for finding contacts within LinkedIn. In fact, LinkedIn makes it rather easy to search for those people you may already know. More importantly, the site lets you see the connections of those you are already connected to within the site. If you have an e-mail contact list, you may be able to import that list and match it up to those who are already using LinkedIn. Chances are, if these people are those you connect with via e-mail, they will be more than happy to connect with you via LinkedIn. Secondly, you can ask a current connection to introduce you to one of their connections. This is a great way to get to know someone that could potentially lead to additional business, job opportunities, or a mentor within your field. Be sure to be specific when asking for a connection; people want to know who you are and how you found them. Mention that you have a mutual contact and hope to connect on social media through LinkedIn. Finally, try to search by company or organizations. These can be companies where you have worked in the past or companies where you wish to work in the future. If you can connect with both current and past employees, you may find very valuable information about the organization. Also, connecting with past managers and co-workers gives you a great opportunity to ask for recommendations. The most important thing to remember is that quantity may not necessarily outweigh quality. While it may be impressive to have 500+ connections, it is also imperative that these are quality connections that can be beneficial to you. When you agree to be connected with someone, you are also saying that you agree to help them as well. Connecting on LinkedIn is vital to your success on this social media site. 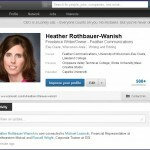 Get started connecting today – search “Heather Rothbauer-Wanish” on LinkedIn and mention you saw this blog post. I look forward to connecting with you! If you have decided to start a LinkedIn profile, you are on the right track to making important connections within your existing networks and beyond. The important thing to remember is that LinkedIn only works if you actually use it. Part of ensuring you are using LinkedIn means that you need to complete a profile. When you start filling in your profile, you will notice a percentage that represents how complete your profile is at that particular time. Profiles that achieve a 100% completion rate tend to rank higher on searches within LinkedIn. You can certainly start your profile and then finish it at a later time; however, I encourage users to think about what they want to write and finish it during a specified time period. Next, you will be encouraged to upload a profile picture to your LinkedIn profile. My LinkedIn profile page has a very professional photograph; please remember this when completing your profile. The photograph on LinkedIn is very small—you want it to represent you at your very best. Personal photographs are appropriate for personal networking; however, LinkedIn is used for more professional purposes such as job seeking, connecting with groups, and representing your business. 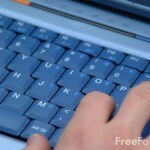 Finally, remember that words are key components of your LinkedIn profile. Make a list of words that appeal to people in your particular areas of expertise. Utilize these words when writing your profile. For example, describe your areas of expertise, mention job positions that may be of interest to you, and describe your reasons for joining LinkedIn. My LinkedIn profile summary is listed below. Because I want to use my LinkedIn profile to promote my business, Feather Communications, you will notice that I have used key words that pertain to the writing and communication industry. Search LinkedIn and view profiles to discover what will best represent your industry, your organization, and, ultimately, you as a professional. With over 12 years of management and communication experience, I decided to begin Feather Communciations in January 2008. Since that time, I have enjoyed working with and writing for a variety of clients, including local, regional and national publications. I have already worked with several clients in Australia and hope to continue my business’ international expansion. Through my experiences, I have given numerous presentations on business communication, e-mail etiquette and freelance writing.